Chiropractors detect and correct subluxations. If your condition, whether pain or some visceral condition like asthma, is caused by a subluxation, a chiropractor can help. Chiropractors correct the cause of the symptom, not merely covering the symptom. While there are over 200 techniques to do this, some have a greater degree of measurable attributes while preserving the philosophy. The Gonstead system as taught by Dr. Gohl is the most structurally and biomechanically specific that produces measurable results. The spinal cord is an extension of the brain. Nerves flow down the spine and out little holes called the intervertebral foramen (IVF). The IVF is formed from the bone above and bone below. These nerves go to each and every muscle, organ, gland, etc. the body. Since the nerves pass thru the IVF it is essential that hole remains as large as possible. Anything that makes that hole smaller will interfere with nerves. Two things that determine IVF size are proper alignment of the vertebrae and secondly the height of the disc. The bone above is prevented from moving forward by a joint of the bone below. However, only muscles and ligaments protect the bones from moving backwards. Under enough or repeated stress, the muscles and ligaments can break down. This makes the IVF smaller. The disc is very strong in a non-degenerated state. However, repeated twisting and bending create and weaken it. This swelling created here tends to affect nerves, if the disc is not properly aligned, it will degenerate and make the IVF smaller. We use five criteria to determine which spinal bone(s) are responsible for your condition. Advanced Instrumentation is the most accurate for determining the exact location of your condition. 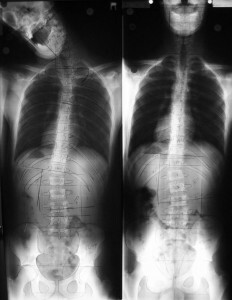 Full spine structural are used to determine how the causative bone has misaligned and how it must be corrected. Symptomatically, clients recover quicker. Before and after always show change, some more significant than others. Over time, disc health will improve thereby increasing overall function of the nervous system. That means the person will be healthier and likely rid themselves of other symptoms they may have been suffering from thru over the years. The system as taught and practiced by Dr. Gohl and Dr. Gonstead is logical, safe, and the most effective chiropractic system developed. Dr. Gohl had more than 50,000 before and after x-rays proving its effectiveness over 60 years of practice.